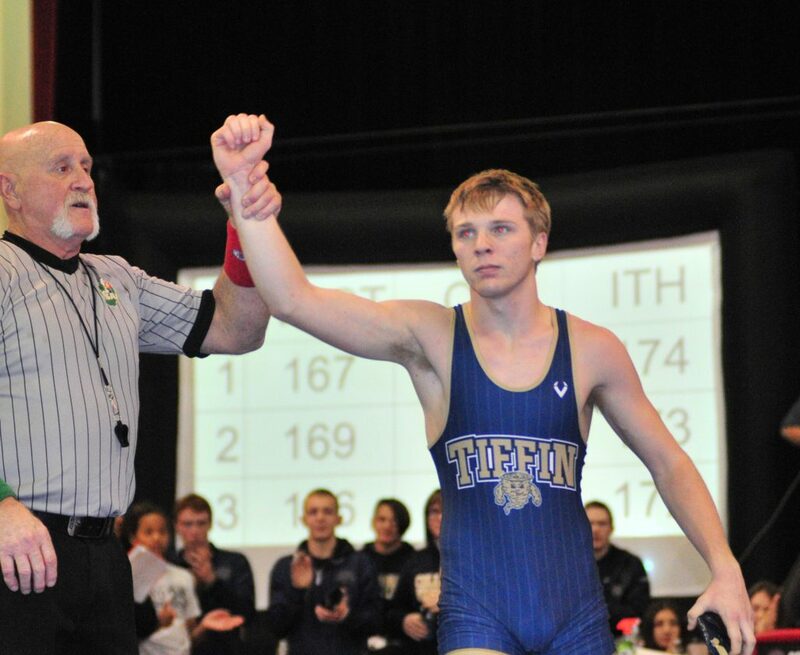 PHOTO BY PAT GAIETTO Above, Andrew Branson gets his arm raised after getting his 100th career win Saturday at the Gene Kimmet Memorial Tournament at the St. Joseph Activity Center in Tiffin. Columbian’s Andrew Branson pinned all five of his opponents en route to being named the meet’s most valuable wrestler Saturday at the Calvert Gene Kimmet Memorial at St. Joe Activity Center. Norwalk claimed the title in a three-way battle with 215 points. Clay nosed out Wauseon 211 1/2-211 for second, with Liberty-Benton holding off Carey 147-133 for fourth. Hopewell-Loudon took eighth (78), Columbian came in 11th (59) and Calvert ended 14th (13). Only one of Branson’s matches went beyond the first period. The senior Tornado stuck Hopewell-Loudon’s Cooper Davidson (1:30), Carey’s Lace Woods (1:45) and Norwalk’s Trenton Goostree (3:00) to advance out of the round-robin bracket. Branson then flattened Clay’s Ashtin Latta (1:04) in the semifinals before sticking Riverdale’s Austin Evans (1:00) for the title. Luc Busdecker (132) added a fifth for Columbian and Evan Keefe (126) ended sixth. Tanner May picked up Carey’s lone title and two teammates finished second to lead the Blue Devils to fifth. May earned the 182-pound crown via forfeit for the Blue Devils against Wauseon’s Trent Davis. The Carey junior dominated his way to the finals, with all four wins coming on pins in less than two minutes each. The runner-up finishes for Carey came from 120-pounder Reese Mullholand and 285-pounder Ethan Schlack. Clay’s Jacob Moon scored a 12-2 major decision win against Mullholand, while Norwalk’s Tche Leroux edged Schlack 4-3. Hayden Jacoby (16) added a fourth for Carey, A.J. Gernert (152), and Isaac Carmen (220) and Drew Steen (285) both ended sixth. Hopewell-Loudon’s Blake Hoover finished second at 113 pounds after suffering a 12-2 major decision loss to Norwalk’s Corbin Ott. Lance Crawford (120) added a fourth for the Chieftains, Levi Kuhn (195) took fifth, and sixths went to Logan Holcomb (132) and Caleb Hinton (170). CASTALIA — Five Bellevue grapplers captured crowns Saturday to lead the Redmen to the team title at the Margaretta Invitational. The championships helped Bellevue coast past Plymouth 239-199 for the crown in the 18-team event. Seneca East took fourth (121), Buckeye Central ended eighth (80), Mohawk came in ninth (76) and Lakota finished 17th (13). Two of the Redmen’s championships came by battling area foes in the finals. Gabe Alda gave Bellevue its first title by edging Seneca East’s Hunter Lacy 9-7 in overtime at 113 pounds. The other such matchup came at 182 pounds, where Bellevue’s Evan Straub pinned Buckeye Central’s Jacob Rowland (2:55). Noah Alda added a title by going 4-0 at 120 pounds in a round-robin format. He dominated his foes, pinning Monroeville’s Thomas Sietz (:48), Willard’s Kelsie Medina (1:26) and Plymouth’s Keith Tuttle (2:27) and scoring a 22-6 technical fall win against North Baltimore’s Brendan Woodword. Dylan Wilson tripped up Bellevue teammate Justin Smythe 3-2 for the 132-pound championship. Justin Mayes gained the 170-pound title for the Redmen by scoring an 18-2 technical fall win against Port Clinton’s Carson Smith. Jack Howey added a second at 195 pounds for Bellevue after getting pinned by New London’s Mitchell Phillips (1:00). Thirds for the Redmen went to Jared Weider (138) and Braxton Berry (182), while fourths went to Jesse Cole (126) and Tryston Brown (145). Derrick Jones (126) added a fifth for Bellevue, with Dominic Griggs (126) and Cody Kile (138) both ending sixth. Seneca East got a title at 138 pounds from Teryn DeBold scoring an 11-1 major decision against Eastwood’s Zane Jankowski. Along with Lacy at 113 pounds, other runner-up finishes for the Tigers came from 126-pounder Luke Bischoff and 145-pounder Bryce Wise. Port Clinton’s Jameson Mullens scored a 10-2 major decision against Bischoff, while Margaretta’s Kaden Keegan doubled up Wise 8-4. Dakota Laughlin (138) added a fifth for Seneca East and Jon Margraf (132) took sixth. Buckeye Central got a third from Jacob Maxhimer (220) and fourths from Isaac Krebs (113) and Chris Acevedo (285). Mohawk’s Morgan Price captured the 152-pound title with a 14-5 major decision win against D.J. Sloane. Bryce Sheets added a third at 195 pounds for the Warriors, and sixths went to Branyon Winings (160) and Grant Theis (170). Lakota got a fourth from Austin Witte (132).